As the last notes of the reprise of “For Forever” fade away, the sobs and sniffles punctuate the rousing applause during the curtain call for Dear Evan Hansen . This Tuesday night, though, as guests readied to leave the Music Box Theatre, where the original Broadway musical has called home since it officially opened to acclaim there in December 2016, lead actor Taylor Trensch grabbed the mic. Trensch, who plays titular role of a high school senior paralyzed by social anxiety, whose loneliness and isolation leads him down a web of lies he can’t contain, told the audience to stick around, his voice just slightly calmer than the one he uses to play Evan. 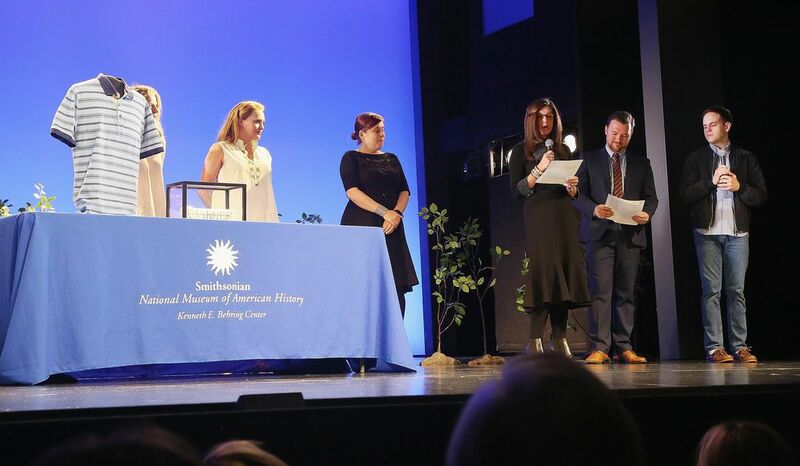 Up on stage, Ryan Lintelman, curator of the entertainment collection of Smithsonian’s National Museum of American History, announced that Dear Evan Hansen was being recognized for “ opening our eyes to the world around us.” The donation ceremony had not been publicized ahead of time, and a few audience members gasped audibly upon hearing the news. In the lead-up to the 2020 opening of its exhibit “Entertaining America,” the museum has been collecting entertainment artifacts with increasing frequency. Rather than holding donation ceremony after ceremony at the museum, curators have been brainstorming new ways to reach the communities of people who are passionate about the work they’re collecting and let them in on the moment. The museum already has a lengthy collection of Broadway memorabilia, as recent as the green silk suit Lin-Manuel Miranda made famous in Hamilton: An American Musical to sheet music that dates back to what’s considered the first American stage musical, The Black Crook . The Broadway collection tells the American story, as Lintelman explains, and each generation reinvents what that means in new ways, bringing updated musicals styles, fresh faces and new ways of understanding the zeitgeist of the moment. “ Dear Evan Hansen does that same thing,” says Lintelman, who compares the musical’s achievements to what Hair did in the 1960s or Rent did in the 1990s. “It has this freshness to it that helps people to connect to these issues of social media and the internet, of depression and anxiety, and how you present yourself in a world that’s increasingly digital. All of that is wrapped up in this,” he says. Benj Pasek, one half of the white-hot composer team Pasek & Paul (the Paul being Justin Paul), came up with the idea for the musical after reflecting upon how his own high school classmates responded to the news that a fellow student had died of a drug overdose. Pasek and Paul worked with writer Steven Levenson, a Broadway first-timer, and director Michael Greif, a familiar titan of American stage, to tease out the students’ responses. Looking past the self-serving displays of mourning, they saw what was driving it: a raw need to connect. The inability to do so despite living in an age that’s never been more connected thanks to technology, opened up the story of Dear Evan Hansen , now the winner of six Tony Awards, including Best Musical. Watching the cast cry through the gripping 2.5-hour performance offers catharsis to the audience, putting voice to the despair of living in the modern age. Evan Hansen swallows his moral compass in exchange for a chance at belonging once a letter he wrote to himself on the advice of his therapist gets mistaken as a note written to him by Connor Murphy, a troubled teen who recently committed suicide. 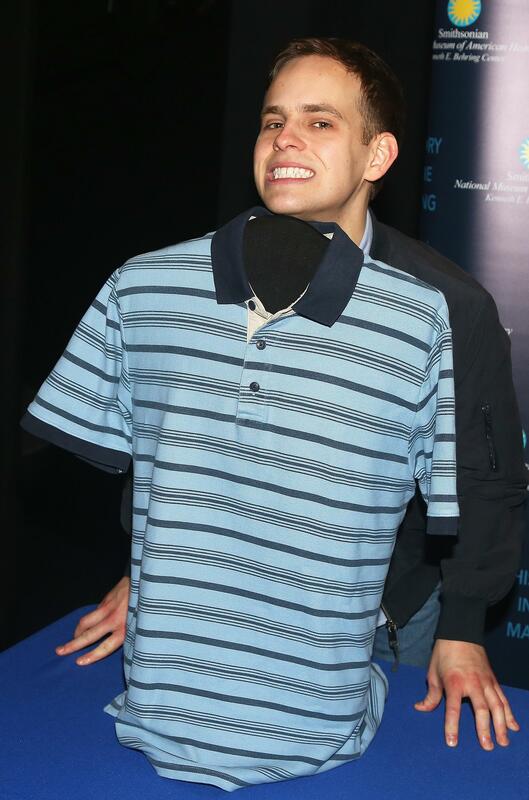 While many of the objects in the entertainment collection arrive at the museum long after the television show or movie has ceased production, that's not the case with the Dear Evan Hansen donation. For each performance, the crew creates an orthopedic cast scrawled with Connor's name, so the cut-open one now in the Smithsonian collections captures a snapshot of one performance with one cast, speaking to the show's ongoing relevance. That's the case, too, for a "Connor Project" button, a "Dear Evan Hansen" letter and sheet music signed by the composers. All together, they represent the journey that Evan, and the show, embarks upon each night on Broadway. Though it is relatively soon to collect artifacts from the show, Lintelman says it was an easy decision to do so. He believes Dear Evan Hansen especially resonates with this moment in American history, and it opens a window to understand this age a little more.